Is this still Vienna?? Yes, it is!! While the tram number 31 slowly takes you from downtown Vienna to the outskirts, you can already dream of vineyards, small colourful houses, good wine and tasty food. 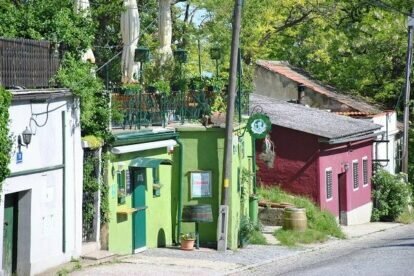 And then – end of the line- it is just a short walk to the main cobblestone alley with all the taverns, wine cellars and vineyards in the back gardens. My favourite way to get there is by a (long) bicycle tour, but you need a decent bike, a good map and some endurance, because parts of the way leads through a rather dreary neighbourhood – before you get to the fields and vineyards. If you can’t be bothered to go by bike: take the tram and dream of yummy food and great white wine!